So over the last week Psystar has created a lot of buzz, controversy, and skepticism with their new Open Computer. They claim their system will run an unmodified retail version of OS X Leopard on non-Apple hardware. Now, EULA breaking legal issues aside, we know from the OS X86 Project, that it is possible to cobble together a beige box PC clone and make it run OS X. The thing is, to date no one has done it commercially and, as far as we know, Psystar has not shipped an Open Computer running OS X yet. Today, Psystar tried to put all naysayers to rest by posting this video on their web site. 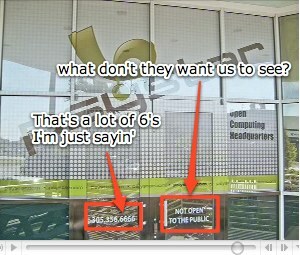 They claim it shows their Open Computers running OS X Leopard, Ubuntu 8, and Windows Xp Professional. Now I am not refuting their claims, but as I watched the video I did notice some things that seem just too wonky not to point out. Besides I always love a good conspiracy theory. As the video opens we see the alleged Open Computer running OS X on the far left. 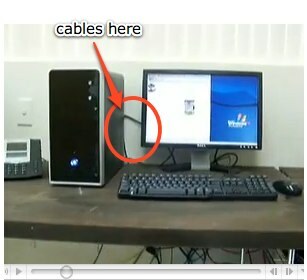 There is a bundle of small cables under the desk below the system and it looks like they are probably Ethernet cables. Nothing too unusual but, as you will see, they later seem to disappear. Even more unusual is the space below the desk on the right where there is an empty wire rack shelf system. Note that at this point in the video there seems to be nothing there. Also note that the area to the right of the display is empty. These two points will become significant later. 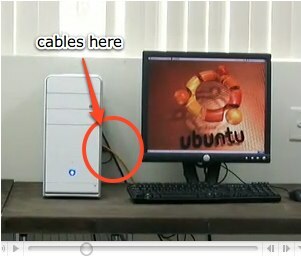 As the camera pans right we see the Ubuntu machine and the Windows box. 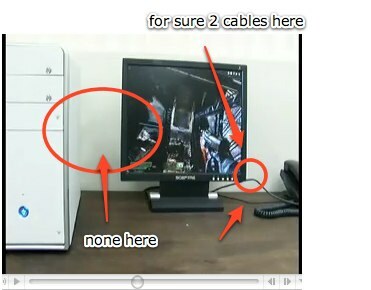 Both have several cables coming out the side of the computer and running to the right toward the monitor. Now notice the Mac system… no cables coming off to the right like with the Ubuntu and PC systems. 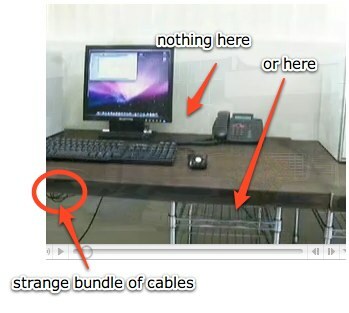 Also notice that the bundle of Ethernet-like cables pointed out in the opening scene no longer seem to be visible. Next the video transitions into showing the Open Computer supposedly running Leopard and the Mac version of Quake 4. 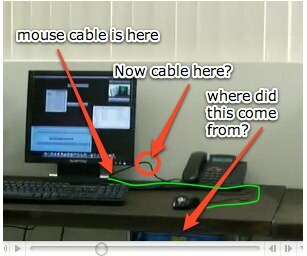 What is interesting in this shot is there now seems to be an extra cable running from the right of the monitor toward the area of the desk where the empty wire shelf system sits. That shelf is also no longer empty as it looks like it now has a strange blue box sitting on it. At first I thought the cable near the monitor might be the mouse cable, but in the Quake demo scene you can clearly see the mouse cable moving with this mysterious second cable above it. 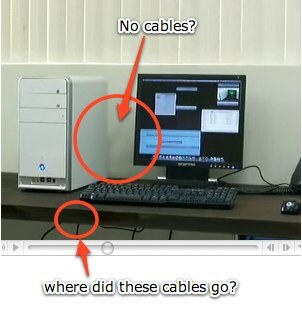 The thicker cable does seem to be the monitor cable and it is going off to the right not the left. Remember, the Open Computer that is supposed to be running OS X Leopard is to the left of the monitor, not the right. Interesting. Finally, the closing shot shows the exterior of the Psystar offices. When reports of Psystar and their Open Computer (initially called the Open Mac) first surfaced on the web, several reports noted that they changed their address as many as 3 times. Now that fact alone is strange enough, but throw in a phone number with an oddly high number of 6’s, plus the fact that they seem to want to keep things private and you have the makings of a full blown conspiracy. Can someone ring up Fox and see if he is available to come down to Florida? One of the goals of good design is to properly position graphic elements in a harmonious way. This includes good video design, especially when compositing titles, images and other video clips together. Both Final Cut Pro and Motion make it easy to reposition, rotate, crop and distort video clips and images in their respective Canvases. 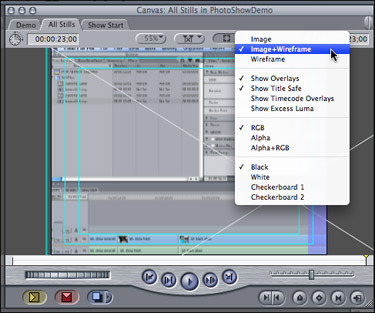 In Final Cut Pro the Image and Wireframe mode must be selected from the View pop-up menu in the Canvas (see figure 1). This tip focuses on moving the clip around. Selecting Image & Wireframe from the View pop-up Menu. Each video editor has their own style and unique workflow, and Final Cut Pro’s remarkable flexibilityâ€”from clicking buttons, selecting menu commands, to using keyboard shortcutsâ€”allows editors to work the way they like best. No matter how you work in FCP, using keyboard shortcuts can make you a quicker, more efficient and agile editor. Here are a few keyboard short cuts that, with practice, can improve your clip trimming performance in FCP. Normally when trimming clips in the timeline an editor selects the appropriate tool (usually the ripple, or arrow tool), then clicks and drags on the edit point to perform the required trim. If your playhead is near the edit point of the intended trim then press the V key to select the edit point. The V key selects the edit point nearest the playhead location (see figures 1 and 2). After a short summer hiatus, in part Final Cut Pro Studio re-certification, we return with more Stuff, Guts, and Video. One way to a more efficient Final Cut Pro workflow is to re-use bits and pieces created during the course of a project. Motion effects, transitions, and filter settings that you’ve spent valuable time adjusting, tweaking, and finessing, can easily be re-used by turning them into favorites. There are a number of ways to create, store and organize favorite effects in Final Cut Pro and I outlined several of those in Stuff, Guts, and Video 008. The problem with storing all these cool items in the Favorites Bin of the Effects Tab in the Browser is, if Final Cut Pro’s preferences ever go bad, get replaced, or if you reset FCP’s preferences. . . boom . . . there go all those favorites. Here are a couple of ways to protect those cool favorite effects, filters, and transitions. First, back up your FCP preferences. I talked about how to do that in the last episode, Stuff, Guts, and Video 012. That way if preferences die, it’s easy to restore those lost settings. Be sure to back up the preferences regularly so that any new favorites that are created are preserved. Second, create an Effects Bin in each project and copy the favorites that are used in that project into the Effects Bin (see figure 1). 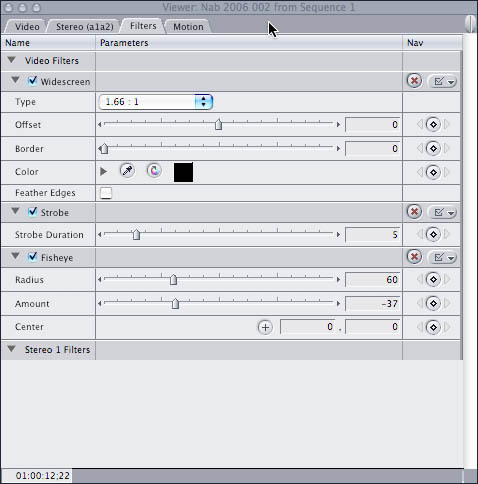 Figure 1: Create a bin in each project to preserve motion effects, filters, and transitions. This keeps a copy of the motion effects, filters, and transitions used by each project with the project, so that even if preferences die, the effects will still be there. I often make a copy of the entire Favorites bin in the Effects Tab in a project as another way of preserving all my effects. Then if something happens to the favorites I can quickly restore them by opening a project and copying them back to the Effects Tab. No one expects that catastrophic events will happen to them while editing a project to a tight deadline, but the better prepared you are the faster it is to recover and keep on editing. Next time on Stuff, Guts, and Video we’ll look at some cool editing keyboard shortcuts you definitely need to know. This tip is good for all versions of Final Cut Pro. One thing that can take down applications in Mac OS X is bad preferences, and Final Cut Pro is just as susceptible to this problem as any Mac application. Here are tips to protect against corrupt preference problems. First, once FCP has been tweaked to your satisfaction, back up FCP’s preferences. Mac application preferences are stored either in the /LIbrary/Preferences folder or in the /Users/”your_user_name_here”/Library/Preferences folder. Final Cut Pro’s preferences consist of the com.apple.FinalCutPro.plist file and the Final Cut User Data folder, both stored in the /Library/Preferences/ in your home folder. Simply copy the plist file and the Final Cut Pro User Data folder to another hard drive or burn it to a CD (you might as well copy the plist files for all the other FCP Studio applications to keep them safe too). Then if FCP’s preferences ever become corrupt, replace them with the back up copy. By backing up the Final Cut Pro User Data folder all of the custom button bars, window, column, and track layouts are also preserved. Now that Final Cut Studio 2 is shipping (I should have my copy soon) here is our first tip for Final Cut Pro 6. I know that many of you are itching to dive in and install the new Final Cut Studio applications and start playing with all those really cool new features, but before you do, take a deep breath, count to ten, and wait. Why you might ask? Because this is brand spanking new software and although Apple does a pretty thorough job of testing, they can’t possible cover every possible configuration users might have. So a few glitches could appear when FCS2 is installed on your Mac. The last thing you need is to redo a project from scratch because upgrading nuked the previous project files or a filter no longer does what you expect. 1. Never, EVER, upgrade software in the middle of a production. 2. Don’t upgrade your primary editing station until the new software has been tested on a non-critical editing station (i.e. the Mac) in a non-critical situation. After some delay, here is The missing Stuff, Guts & Video Episode 9, with more to follow shortly. In editing it is often necessary to compare frames of video in a sequence, for color correction, matching clips shot at different times or with different equipment, adjusting filters or aligning visual elements in several clips. Final Cut Pro’s Frame Viewer tool makes makes these kinds of comparisons a snap. Here’s how it works. Access the Frame Viewer by selecting it from the Tools Menu or use the Option-7 keyboard shortcut. The Frame Viewer appears as a tab within the Tool Bench window (see figure 1). 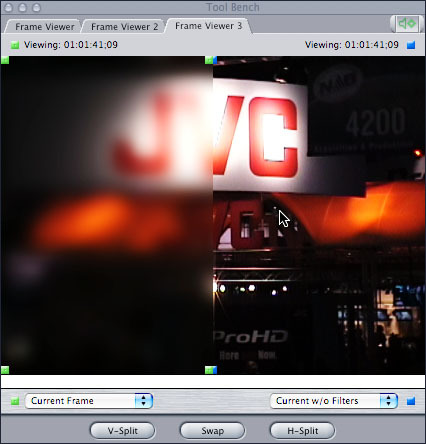 Figure 1: Frame Viewer showing two views of the same clip with a blur filter applied. I’m reporting this week from the National Association of Broadcasters convention in Las Vegas (www.nabshow.com), where cool things are happening in the world of video editing and podcasting. NAB hosted it’s second Podcasting Summit, further establishing podcasting as a legitimate and viable content delivery method. Sessions held Saturday and Sunday covered podcasting essentials, encoding tools and techniques, demystifying RSS, distribution strategies and metrics, marketing your podcast, and the legal issues of podcasting. Serious podcasters should consider attending this event next year. On Sunday, April 15th, at the Venetian Ballroom, at the Venetian Hotel, Apple hosted a special event, basically a keynote presentation followed by a finger food reception. 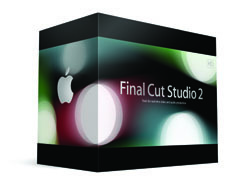 During the keynote given by Rob Schoeben, Appleâ€™s vice president of Applications Product Marketing, Apple announced a brand new product, Final Cut Server and an updated version of Final Cut Pro Studio (FCPS 2). By now there are many web sites commenting on the new products and features, so I’ll just summarize here and provide links to the appropriate pages at Apple’s Web site. 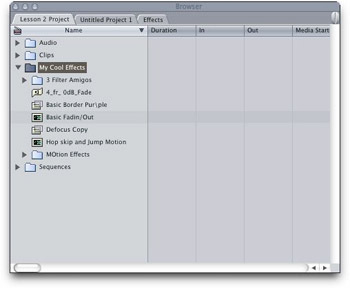 In the last episode on saving filters and effects I missed one cool option for saving several filters at once. I did mention organizing several related effects into one bin, but Final Cut Pro can do that for you, at least with multiple filters. Simply load the clip with the group of filters to be saved (see Figure 1). Figure 1: A ciip with several filters loaded in the Viewer Window. You spent hours fiddling, adjusting and tweaking the parameter settings for a particular effect (filter, transition, or motion) until it looks great. Now twenty-five additional copies of the same effect are needed. But rather than spending several more hours replicating the effect each time, Final Cut Pro provides several ways to easily save effects to reuse in the current project or future projects.